Sara Daleiden will be available at the Q&A after the screening. 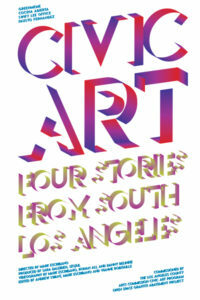 This documentary stems from the last four years of work she collaboratively performed as an art and public engagement consultant for the Los Angeles County Arts Commission Civic Art Program as part of their Open Space Creative Graffiti Abatement Project. 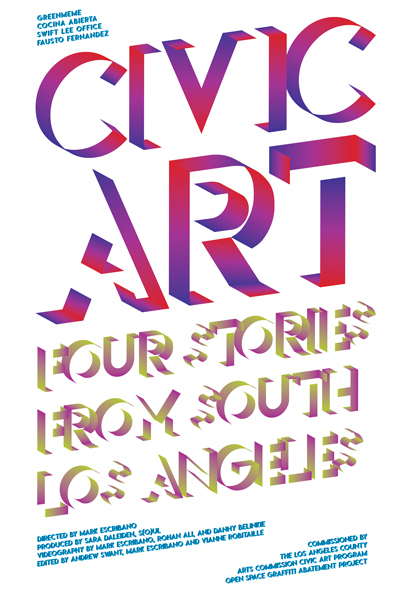 Weaving connections between social and physical art production as civic engagement, the documentary follows four artist teams in four public spaces (two parks and two libraries) in four neighborhoods in South Los Angeles County. We find it to be a gentle portrait of cultural exchange in an urban U.S. American landscape. We imagine there will be more screenings to come in Milwaukee and Los Angeles in the coming year so stay tuned for that if this doesn’t work! Promises to be an interesting discussion about gender and working in the arts! Marilu is a long-time colleague and a favorite cultural firebrands in Milwaukee and internationally. An opportunity to engage with her, Michelle and the other people involved with the project who associate to being arts workers and women, and perhaps feminists too, such that there will be an exchange about our relationship to our shared representation. At the base this will be a conversation around defining and acknowledging labor. In connection with the Beerline Trail Project, join us tomorrow night, Friday, September 22 from 6-10pm, for Riverworks Week’s Creative District Alive! festival. 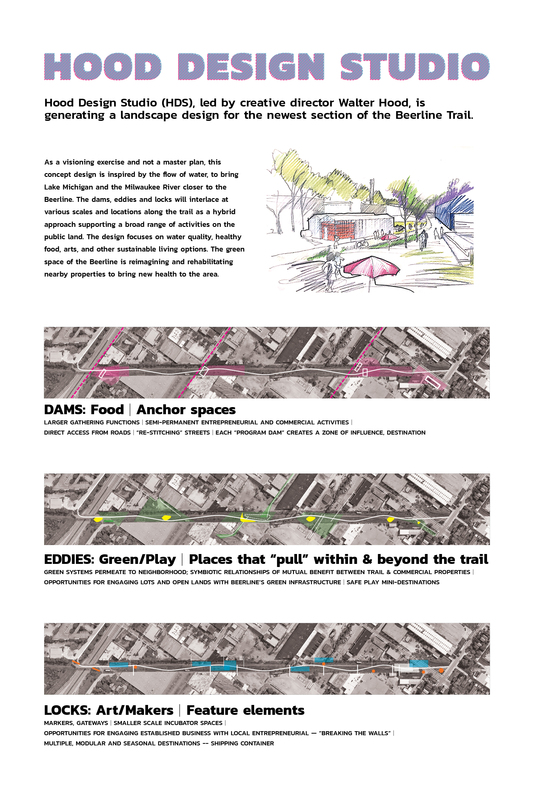 We will have a display of the Hood Design Studio concept design for the linear park and Alma Du Solier from the studio and Sara Daleiden of MKE<->LAX will be present along with other Beerline Trail collaborators to gather neighbor feedback. We’d love to have you stop by if you have time! You can enter at Capitol Drive or Abert Street at the Beerline Trail extension. We have an online survey for the concept design so you can give feedback that way if you prefer. Full concept design PDF available for viewing here. Please feel free to share as you see fit! 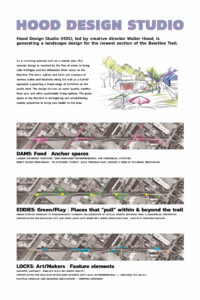 The Beerline Trail Neighborhood Development Project is a creative placemaking collaboration convened by the City of Milwaukee, Greater Milwaukee Committee (GMC), MKE<->LAX and Riverworks Development Corporation and Riverworks Business Improvement District (Riverworks). Additional collaborators include the Greater Milwaukee Foundation (GMF), Local Initiatives Support Corporation (LISC), Wisconsin Women’s Business Initiative Corporation (WWBIC), and our Guiding Lenses Group, including a range of cultural leaders from the neighborhoods and the city. This project builds from the history of the Beerline Trail initiated in 2002 and Creational Trails: The artery initiated in 2012. Our intention is to sustain and enrich the lives of people in these neighborhoods by promoting health, well-being and prosperity through increased circulation of resources, voices, ideas, labor and creativity. For more information, please visit the GMC Creative Placemaking Initiative to review the Resources and Updates at the bottom of the webpage. This past year, long-time MKE<->LAX mentor and collaborator, Los Angeles-based artist Anne Bray, came in residence in Milwaukee to generate Designing Equity. The project focuses on stimulating public dialogue around race dynamics in Milwaukee and within the creative industries. MKE<->LAX partnered with The Frank P. Zeidler Center for Public Discussion and Greater Together to have Anne share her internationally recognized public art and experimental new media art practice through a residency intensive with a racially diverse group of 12 local artists, designers and advertising creatives. The collaborative group generated an initial public art and media project and a proposal for future project growth that was vetted through facilitated community dialogues and a review with creative industry leaders. Our proposal is based in research and development of an agency of creative talent that can advocate for racial equity in the creative industries, partly through providing an active network of creative workers. Visit the Zeidler Center webpage to view the project video, [Breaking Boxes] workshop results and project report. You may find of particular interest our proposal for moving forward with the agency on page 7 of the project report. Thank you to the Greater Milwaukee Foundation for an Arts and Culture Grant to support this endeavor that included covering consulting fees for all creatives involved with the project. And thank you also to those of you who contributed to this process! The Zeidler Center, MKE<->LAX and Greater Together have partnered on an initiative called Designing Equity to bring awareness to Milwaukee’s racial and economic inequality through public media campaigns, public art, creative placemaking, and facilitated public discussions. You can view the project on our website: https://www.zeidlercenter.org/design. While there, check out our project video and the first iteration of our [Breaking Boxes] workshop which featured Ex Fabula storytellers! If you would like to be involved with upcoming Designing Equity events or if you’re interested in sponsoring this initiative, please email Dr. Katherine Wilson at katherine@zeidlercenter.org. The 25th anniversary of the 1992 civil unrest in Los Angeles is this weekend, and the FORWARD LA: Race, Arts and Inclusive Placemaking conference at USC in Los Angeles was powerful. Wishing us all peace, endurance and clear vision for growing our culture together now. RISE and SHINE is the first episode in our series of short documentary videos about the re-emergence of the Bronzeville Cultural and Entertainment District in Milwaukee. Through Bronzeville Autumn, we are bringing together culture, history, art, commerce, and community rooted in this rich urban tradition. This first episode is comprised of interviews with key stakeholders including Alderwoman Milele Coggs of the City of Milwaukee, Deshea Agee of the King Drive Business Improvement District and Melissa Goins of CUPED Corporation, along with a window into the neighborhood and programs connected to this current cultural development transformation. The 2016 Bronzeville Autumn series began with Art House Trap at Jazale’s Art Studio, featuring an evolving interactive art installation created by Mikal Floyd-Pruitt, Vedale Hill, Manny Vibe$, Kevin Boatright, and other artists. Bronzeville Autumn is an initiative of CUPED Corporation, Jazale’s Art Studio, Friends of Bronzeville and MKE<->LAX, in collaboration with the City of Milwaukee, Alderwoman Milele Coggs and the Historic King Drive Business Improvement District. MKE<->LAX is currently an artist-in-residence at Jazale’s Art Studio in Bronzeville. Support was generously provided by the Greater Milwaukee Foundation through the Marvin W. Haesle Fund for the Arts, the Patricia Ray Howell Fund, and the Martin Luther King Memorial Fund. 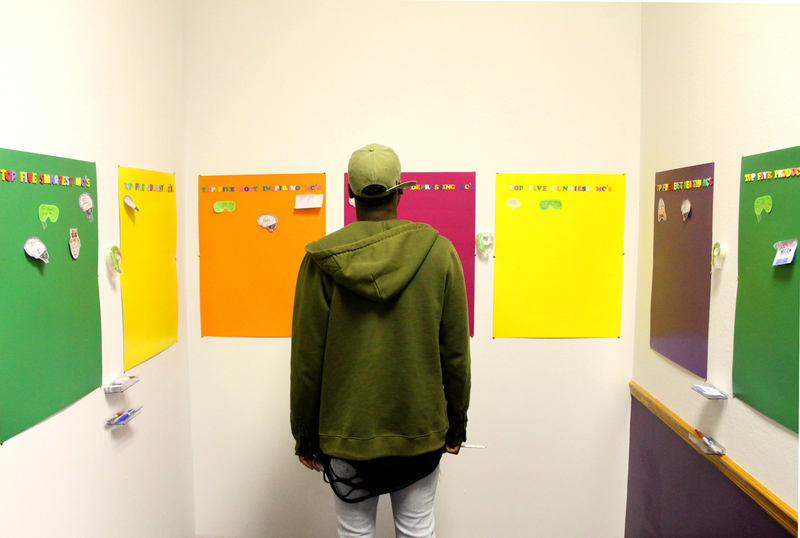 A guest takes in the responses left by others before he contributes to Mikal Floyd-Pruitt’s interactive installation piece for Art House Trap. Monica Miller is not a native Milwaukeean but has been calling Milwaukee home since 2009 when she started school at Milwaukee Institute of Art and Design (MIAD). During her time at MIAD, Monica met Sara Daleiden and shortly started to become more involved in Sara’s work through MKE<->LAX. In 2013, Monica visited Los Angeles for the first time and in that two week visit, Monica was invited to observe a class at the Graduate Public Practice program at Otis College of Art and Design. This is when I first met Monica but not the last. Two years later, I had my first residency with MKE<->LAX in November 2015 and Monica generously volunteered her time to show me around. I will never forget her taking me to a house, walking to the basement and in the corner was the smallest art show I’ve ever seen, in a closet! In that trip, I was invited to participate in my first femTALK. femTALK, which meets on a near-monthly basis, is an assembly of individuals who identify as females created out of a request for support from other female artists that associate with an art world primarily dominated by white males. I was immediately impressed by the inclusiveness of this group and my ability as a first-timer to speak openly and candidly. When I returned to Milwaukee in the summer, I was excited to work with this group and Monica more closely. Now, Monica and I are roommates and while we have many conversations about Milwaukee, Los Angeles and art production, it was great to sit down more formally to discuss these topics more in depth! Since you were recently in Los Angeles as an artist-in-residence at The Little House Gallery through MKE<->LAX, let’s talk about that – what were your first impressions? I could sense it was bigger than a city I was used to. It was much more vast than I expected. I thought it would be a lot more clustered. There are vaster spaces of land and longer stretches when commuting. Because I knew I was going to a city I expected it to feel more city-like. LA doesn’t quite feel like a metropolitan city. New York, for example, is way more condensed. When you’re in those pockets of vastness in LA, you really feel you are in a desert. I took the bus a lot and that was nice because I got to see the landscape more. And that’s what I enjoy about LA – you’re obviously in a very specific ecosystem but the landscape paired with the architecture really shifts depending on where you are. And you can really see that progression especially while taking the bus. The first time I was there in 2013 was for two weeks and I really loved taking the bus and the train. I had time to go all over the city the first time and this last time I was much more located. This time you spent most of your time in Venice – how did you like that compared to the other neighborhoods you visited? I think Venice Beach is so weird! The first time I stayed in Boyle Heights, I didn’t even know what that was before visiting, but I loved it. I was able to feel a lot more at home there. The artist residency where I stayed in Venice is super close to Abbot Kinney and I felt so much more like a tourist. It was really odd to walk around and see all these boutiques, expensive stores and people vacationing. I’ve never lived in a place that has that kind of draw. Milwaukee doesn’t really have that draw except during Summerfest but then you know where it is and can avoid it. And how was it for you to work in Los Angeles and see people working in Los Angeles who mostly know you in a MIlwaukee context? Los Angeles has this shininess to it so while I feel like I’m having this intense new cultural exposure and experience, they’re just living their life as they do. LA is much more laid back. And I don’t know if this is right but I sense you can get a lot more done in Milwaukee in a day than you can in Los Angeles because of transit time. This last time I was there I had to work on independent freelance work back home and I was having artist meet ups and such. I felt like it was so much harder to get work done in Los Angeles because of that commute. You spend a condensed period of time in a space because you’re not going to move once you’re there. And I think that’s where the relaxation comes in because you have no choice but to just chill out. That’s definitely true! Getting from place to place in Milwaukee is so rarely over 5-10 minutes – so we definitely have more time here because of that. Yeah and especially now that it’s the winter, we huddle. We don’t want to go out and do stuff. While we can still commute a lot more here and go to different part of the cities more easily, there is an inherent need to draw in. Of course, in the summer everyone is out and it’s a lot more social. But I think I work better in colder environments. Maybe that’s a Milwaukee condition once it becomes warm you don’t want to do anything indoors. I can’t focus when it’s hot and I also don’t want to be inside working when it’s nice out! This last visit you were able to host a femTALK in LA, how did that go? It was so good! Everyone responded so warmly and enjoyed being together. I think it was really important for women to be together and I don’t think they really have shared space. Some of them didn’t know each other but there was an immediate sense of camaraderie to the credit of Tracee and Sara organizing them and that was great. And from a practice standpoint, it was really validating. I’ve had a lot of hot or cold experiences with people from Los Angeles. A lot of it has been ego-driven and/or fake. Luckily, none of that has happened with people I have met through MKE<->LAX but I’ve worked in other art spaces where we’ve worked with people from LA and those stereotypes of what people are like coming out of that region have come true. Of course, I’ve met really great people too so I just wasn’t sure who was going to show up or what to expect. I know where I stand in Milwaukee as a producer so coming to a new space, with a new group of people and practitioners, I didn’t know how I would be read. As it is, what I do in Milwaukee is often seen as odd half the time. Going to present femTALK which is a really different project and has a lot of layers to it, was received so well. I have an understanding now that LA’s depth for culture and art production is way deeper than Milwaukee. I agree but why do you think Milwaukee isn’t able to go as deep in terms of art and cultural production? It’s sort of known that the Milwaukee art scene is scarcity driven – there are never enough opportunities. And because of this scarcity, you’re going to jump at any opportunity, maybe without a criticality around it. Sometimes because it’s a necessary line on your resume. I also feel that there is never enough critical dialogue about what has been done. I think people feel like you can’t critique the do-ers in this city – that if you critique they’ll stop doing or making. On top of all that, I think that Midwestern niceness is often afraid of critique. Speaking of do-ers, there was a lot of Milwaukee do-ers, yourself included, in the room at the Designing Equity intensive. Any takeaways from that experience? What I really liked about the intensive, and what I realize we don’t do enough of here because we don’t value it, is iteration. Iteration is really important and that’s where critique happens. It may not happen as directly but there’s an editing process that happens during iteration. In Milwaukee, a lot of the production is grant-based and you have to consider a timeline. Some are a full year and the projects that people take on often need longer than that to develop. Due to time and lack of resources, you never leave enough room to just sit with something. You are struggling and producing, producing and producing right up until the last minute. By the time you’re done and have time to catch your breath it’s over. Instead of having enough space to really think about what you’ve done. I don’t feel like there’s enough time and then people are off the payroll so they aren’t paid to think critically about what they did. I think the intensive has been a good model to show how valuable time is for projects to develop. Are there any other thoughts about your visits to Los Angeles and it’s influence on your work here in Milwaukee? One of my major takeaways was the commute. For example, from Little Tokyo to Venice Beach takes an hour and a half commute by public transportation. And Milwaukee to Chicago is an hour a half commute. This got me asking myself why can’t I just go to Chicago more? Before, I might go to Chicago once a year but after this LA visit I’ve been to Chicago four times. It made me consider scale much more. Join us, in Bronzeville, for a night of art, performance, music, culture & community. Proceeds benefit Jazale’s, so you can support a good cause while you have a good time! MUSIC // Turtlesooup spins his current selection of really good music. Bronzeville Autumn is our second season of art and wellness programs for the Bronzeville Cultural and Entertainment District which included Art House Trap. Bronzeville Autumn is an initiative of CUPED Corporation, Jazale’s Art Studio, Friends of Bronzeville and MKE<->LAX, in collaboration with the City of Milwaukee and Alderwoman Milele Coggs. This season follows the successful launch of #BronzevilleSummer that included the 4th Annual Jazz in the Hood at Garfield School Cultural Campus, the 4th Annual Bronzeville Week, 19th Annual Garfield Blues, Jazz, Gospel and Arts Festival, and Juneteenth Day Parade and Street Festival, as well as performances, exhibitions and youth arts workshops at Jazale’s Art Studio. Through Bronzeville Autumn, we are continuing the work that has gone into bringing together culture, history, art, commerce, and community rooted in this rich urban tradition of the Bronzeville Cultural and Entertainment District. In collaboration with many community partners, this multifaceted series focuses on art and wellness featuring performances, installations and workshops by local artists, food and crafts with local vendors, health and wellness awareness activities, and community meals. Kickstarted November 5, programs are open to the public and free, with activities for youth and adults. Support for Bronzeville Autumn is generously provided by the Greater Milwaukee Foundation through the Marvin W. Haesle Fund for the Arts, the Patricia Ray Howell Fund, and the Martin Luther King Memorial Fund; Crescent Cardboard Co, LLC; Bader Philanthropies; and Boys & Girls Club of Greater Milwaukee. 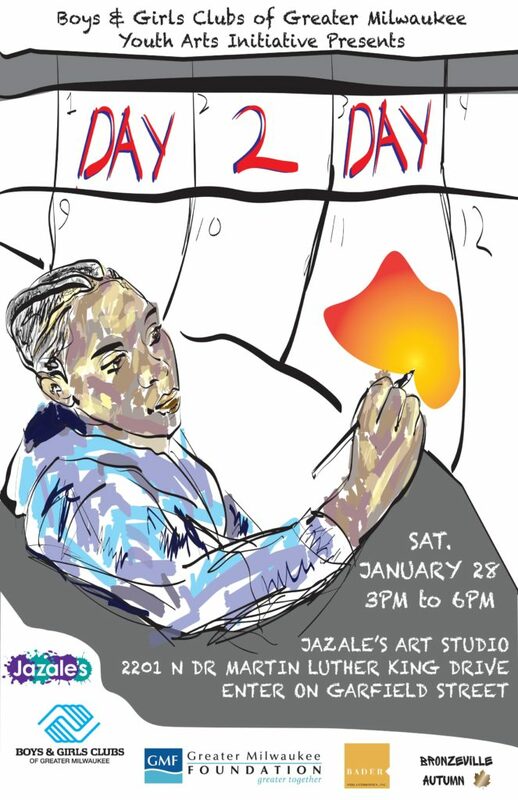 Jazale’s Art Studio – 2201 N Dr Martin Luther King Drive, entrance on Garfield Ave.
Day 2 Day will feature student artwork that reflect the “day to day” their life experiences. Students explore topics ranging from safety, bullying, the educational system, and food deserts. All artwork will be available for $20 each and will go directly to the artists.